Petzl AQUILA Climbing Harness. With adjustable leg loops, the AQUILA harness is a high-end model ideal for technical and alpine climbing. The FUSEFRAME Technology construction produces a slim, clean, lightweight design that offers excellent comfort. 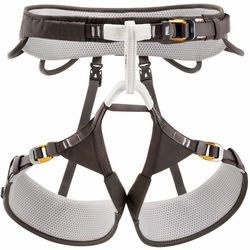 This harness is equipped with four equipment loops that allow optimal organization of equipment, and has DoubleBack HD tightening buckles for quick adjustment of waistbelt and leg loops.